Italian voters have unambiguously rejected the politics of the Monti government and the European Union. This has triggered panic and outrage in Europe’s capitals and unleashed ferocious tremors on the international finance markets. Some 55 percent of the electorate voted for parties that spoke out against the EU in their campaigns. The slate headed by outgoing Prime Minister Mario Monti, which was supported by Brussels, Berlin, the Catholic Church and numerous Italian businessmen, only received 10 percent of the vote. The Five Stars Movement of the comedian Beppe Grillo has become the single strongest party in the Chamber of Deputies, the lower house of the Italian parliament, winning slightly more than 25 percent of the vote. It came just ahead of the Democratic Party of Pier Luigi Bersani. The joint slate of the Democratic Party and Sinistra Ecologia Libertà (SEL) is the strongest force in the lower house and is thus awarded 340 of the 630 seats under existing electoral law. The election for the Chamber of Deputies was extremely close. The slate headed by media billionaire and former prime minister Silvio Berlusconi, who had also opposed the EU, received just 0.4 percent fewer votes than Bersani’s slate. If Berlusconi had received 125,000 more votes, it would be he who now held the majority in the Chamber of Deputies. The 29.5 percent vote for Bersani’s slate is significantly less than in the last election five years ago, which Berlusconi won. At that time, the Democrats won 33 percent themselves, and 38 percent for their combined slate with other parties. No list has a majority in the upper house, the Senate, where the seats are not awarded nationally, but are based on the results of the twenty regions. Bersani won 119 seats, Berlusconi 117, Grillo 54 and Monti 18. Since all laws must be passed by both chambers of parliament, Bersani needs the support of Berlusconi or Grillo to form a working majority for his government. This has led to outrage in the capitals of Europe and the media. “Italy is paralysed and ungovernable”, ran the comments in numerous editorials, which blamed the Italian electorate for this situation and berated them for it. Some read as if the author wanted to abolish free elections sooner rather than later. For example, the Frankfurter Rundschau accused Italian voters of a “flight from reality”. “If one were being malicious, you might come to the idea that Italian voters were for sale”, the paper, which is close to Germany’s trade unions wrote. “They prefer the political show-boating of two entertainers like Berlusconi and Grillo to the sober analysis of the economic politician Mario Monti and the social democrat Pier Luigi Bersani, who do not hide the fact that the way out of the debt crisis is and will remain painful for everyone”. In reality, Mario Monti is anything but a sober professor of economics. The former EU commissioner is a trusted steward of international finance capital. He has worked for the investment bank Goldman Sachs and was a board member of the Bilderberg Conference, an informal gathering of influential people in big business, the military, politics, the media, academia and the aristocracy. Following his defeat, Monti will hardly play a role in the next Italian government. But it cannot be excluded that Bersani may reach an agreement with Berlusconi or Grillo to continue Monti’s austerity programme. Berlusconi, who is primarily concerned with protecting his own wealth and ensuring his immunity in face of numerous criminal cases, has already sent the appropriate signals to Bersani. “Italy must not remain ungoverned, we must think about it”, he said on Tuesday in a TV interview, casting his glance towards the Democrats. Behind his populist tirades lies a right-wing liberal world view, which would not stop him from cosying up to the far right. Grillo insists that he is neither right-wing nor left-wing, and invited neo-Nazis and supporters of the racist Northern League to support his movement, “if they share our ideas”. 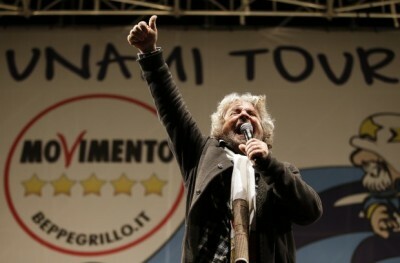 In the northern Italian city of Parma, where Grillo’s Five Stars Movement has held the office of mayor since May, it has made headlines mainly through implementing strict austerity measures. Grillo’s programme is a muddled collection of unrelated demands, such as can be found with the Pirate Party, the Greens, and liberal and right-wing parties: free internet access for all, ecological energy, no money for defence and major transportation projects, benefits for all, protection of domestic industries from international competition, restriction of politicians’ salaries, cutting jobs in the state apparatus, and so on. The fact that opposition to the austerity measures of Monti and the EU has benefited the populist Grillo and right-wing demagogue Berlusconi is a result of the utter bankruptcy of the so-called Italian left. The Italian Communist Party (PCI), the largest in Western Europe, has defended the Italian state since the end of the Second World War. However, due to the Cold War and the party’s relationship with the Soviet Union, it was never in government; thus the PCI retained the hammer and sickle on its banner and enjoyed considerable support among workers. After the collapse of the Soviet Union, it gave up these symbols and transformed itself first into a social democratic party and then, modelling itself on the Democrats in the US, into the Democratic Party. In the meantime, it has become the government party of choice not only of the Italian but also the European bourgeoisie. Another wing of the PCI, hanging on to the old symbols, formed Rifondazione Comunista (PRC, Communist Refoundation) and absorbed numerous middle-class pseudo-left groups into its ranks. In the 1990s, the PRC was hailed throughout Europe as a model for new “left” parties. In fact, it used its considerable influence to secure a parliamentary majority for the anti-working class politics of several technocrat-led and centre-left governments. In 2006, following Rifondazione’s entry into the government of Romano Prodi, a forerunner to Mario Monti, the PRC broke apart. Since then, none of the organizations that have emerged from the PRC have seriously challenged the politics of Monti, because they basically all agree with them. In the 2008 parliamentary elections, Sinistra Critica, which belongs to the Pabloite United Secretariat, received 169,000 votes. This time, it opted not to participate in the elections in order not to take away any votes from Bersani. It justified this by saying that “today there is no political and organizational basis … for a broad anti-capitalist alliance”. The PRC itself joined a slate with liberal and green parties under the leadership of the former anti-Mafia attorney Antonio Ingraio, which proclaimed the fight against corruption and criminality to be the priority, while social questions played hardly any role in its campaign. Ingraio’s slate received 765,000 votes but obtained no seats in parliament. Five years ago, a rainbow alliance led by PRC had received 1.12 million votes. The Italian elections and the political crisis that they have triggered herald fierce social struggles in Italy and throughout Europe.